Pat Lipsky owes more to Monet than she does to Mondrian. This might seem contentious in relation to an artist whose name signifies abstraction, resolute and pure. Take it as a cry for attention on behalf of experience and sensuality in an artist who, on the surface, seems wrapped up in the disciplines of structure. The nine works in this show — Glaukonome, Cousin Joe, and For Sigmund Engelberg constitute Trilogy, which the artist considers a single work — adhere to a similar geometric pattern. There are alternating sets of two and three vertical divisions, in which each division itself subdivides horizontally at differing halfway marks, the positioning of that divider and/or the thickness of the column being the set determinants. The halves of each column are filled with an unmodulated area of color applied more or less flatly, making identification with Monet the point voluptuary over the “hard-edged” Mondrian harder to sustain. Her format has evolved over the last decode to become a trademark, varying from show to show by such factors as borders between the sets, a border around the whole composition isolating it upon the canvas, greater and lesser numbers of sets, wider rectangles, and so on. Such permutations notwithstanding, what is clear with Lipsky is that structure is ancillary to color. Like the sonnet, once you are aware that you have the visual equivalent of fourteen lines: strict and specific meter, and a set rhyme scheme, you move on to what counts far more, namely content, meaning, emotion. As with a sonnet, content is liberated by the form in which it is incarcerated. Color is her subject the way language is the subject for Joyce. Which isn’t to say she is a formalist in the life-exclusionary sense any more than he is: there is everything of life in both artists; as experienced in color for the painter, or language for the writer. Her color is never schematic, or idealistic, or metaphysical. It never arrives on the canvas in what you might call a nominal state: the kind of bright, unmistakable, no-nonsense, out of the baffle color that announces itself from across the room as, say, “Blue”. (I mention blue with the paintings of her last show in mind, which, so to speak, starred blue.) Instead, you get a family of blues where the distinctive feature of each shade is its distance from a preconceived notion of blueness. To name each segment is to raid your memory banks for blues experienced in the world: skies at certain times of day, bodies of water, beloved garments, old master paintings, stained glass, paint applied to products and places. Her hues, so redolent with emotion and association, elude names to be found on paint tubes or charts. Lipsky’s color is empirical — observed in painters she loves like Monet or Bellini, or in “life,” although paintings in museums are as much her reality as anything else. But wherever it is from, her color is particular; contingent, rather than general; impure in the sense of being lived in. An influential teacher of Lipsky’s at Cornell, the art historian and Jewish Museum director Alan Solomon, alerted her to the “ascending arabesques” in Seurat. This spirited and original interpretation of Seurat’s compositions came back to Lipsky when she noticed the often near-symmetrical arrangement of her own horizontally divided verticals in this current body of work. The artist herself experiences structure and color in a way that corresponds to a kind of thought-feeling dichotomy, but it would be a mistake to imagine Lipsky determining a structure and then filling it in with this color or that. On the contrary, her canvases exude an organic unity in which the divisions between structure and color dissolve. We have a sense that her colors have shape, that her shapes found their color — they certainly contain their color, rather than cropping them from some notional larger or infinite field of the given color — even if the rigor and precision of the work make it hard for us to imagine, in practical terms, how it might have been possible to work so intuitively. Her structural elements, which really don’t need names, are ironically easier to name than her colors, which cry out for names. In these ascending/descending patterns they put you in mind of organ pipes. The critic Ken Johnson once compared them to piano keys. You can equally imagine tubes half-filled with colored liquids. Lipsky herself has begun to think of them as being like columns in a Greek temple, permitting us, in turn, to view the horizontally bigger divisions as drastically cropped landscape segments, connecting with their displaced neighbors “behind” the columns. (This doesn’t contradict the earlier assertion of the color not feeling cropped as it’s the scene, not the color that we are talking about.) This occurs in several paintings — Torah, Cousin Joe, For Sigmund Engelberg, Glaukonome — where a central pair of brighter verticals will share a “horizon line” whereas the triad of two outer and one central verticals, darker, will have their horizontal dividers in different places, or only the outer two of the triad will marry up. But the paintings are non-representational — inherently democratic, the flat picture surface doesn’t impose a figure-ground relationship — however much the viewer projects identifications upon her structures and their dispositions of lights and darks, making, for instance, marine associations. In both these instances, Proust seems almost as interested in the multiplication of views as he is in beholding the sea itself. Indeed, in the section leading up to the Glaukonome passage, he sets the scene, describing the extraordinary way different lights enters a room: from a light well, from the shoreline, viewed obliquely, and from the countryside, different lights bounce together and intersect on the unwindowed fourth wall of the hotel room. It’s an apt metaphor for Lipsky’s abstraction. The people named in some of these paintings — Joe and Sigmund Engelberg — are, like her father in Not Too Well Daddy, 2005, deceased family members. Whatever personal reasons she might have for naming these paintings so, it signals to the viewer “remembrance of things past.“† The Proustian seas, inevitably, are as much temporal as spatial. “I never saw the same one twice,” the narrator writes of the seas revealed behind his Balbec curtains. 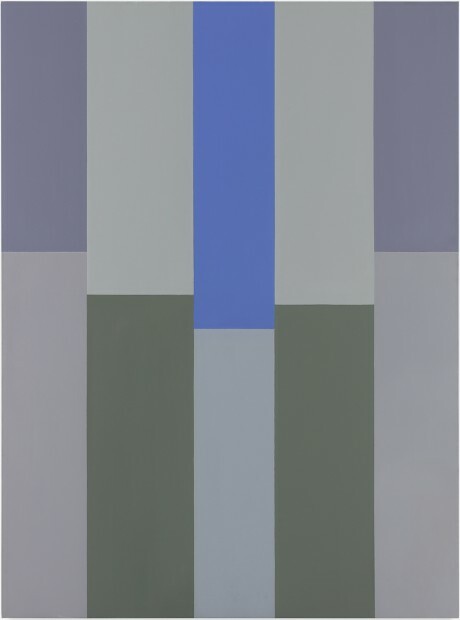 Lipsky resists literal repetition of colors, however close in hue two or more rectangles may be within on almost serial composition; this insistence on variation, along with the night and day contrasts of light amongst sets of verticals within the same work, make her structures as much about time as space. † The phrase from Shakespeare’s sonnet tempted Scott Moncrieff (though not Proust) as his English title for A la recherche du temps perdu.